Designed to engage even the most reluctant reader, this title helps your child will learn all about Han Solo, his sidekick Chewbacca, his relationships with Luke and Leia, and his enemy, Jabba the Hutt. Get your child hooked on reading as they learn all about The Adventures of Han Solo from the Star Wars movies. Designed to engage even the most reluctant reader, your child will learn all about Han Solo, his sidekick Chewbacca, his relationships with Luke and Leia, and his enemy, Jabba the Hutt. 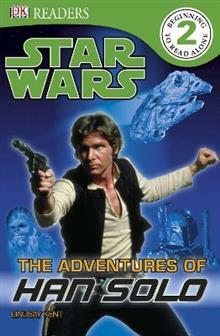 Discover all about the Millennium Falcon and the amazing journeys Han goes on. Filled with stunning pictures from Star Wars , it's an out-of-this-world read. And don't forget, there's a galaxy-full of DK Star Wars books to collect.